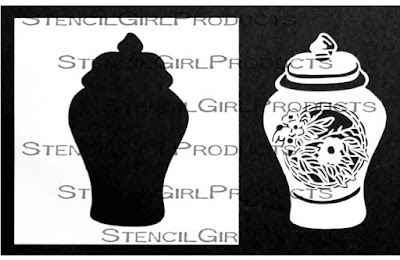 StencilGirl Talk: Pollen for the Bees and a Chinoiserie Bouquet are among our newest stencil releases! 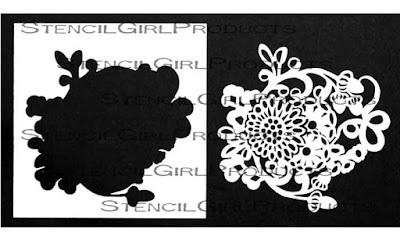 Pollen for the Bees and a Chinoiserie Bouquet are among our newest stencil releases! 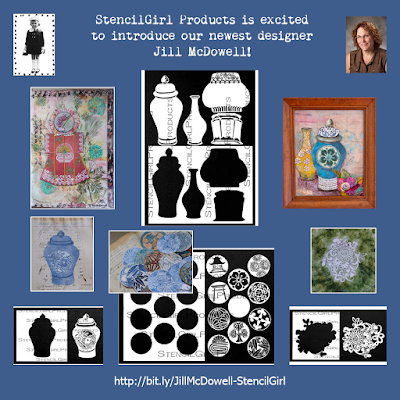 We like diversity here at StencilGirl and we are thrilled to introduce you to our newest stencil designer and one of our accomplished stencil designers. 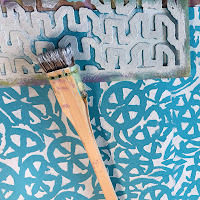 We dare you not to find stencils that must be a part of your favorite studio tools with Jill McDowell and Daniella Woolf as the designers! 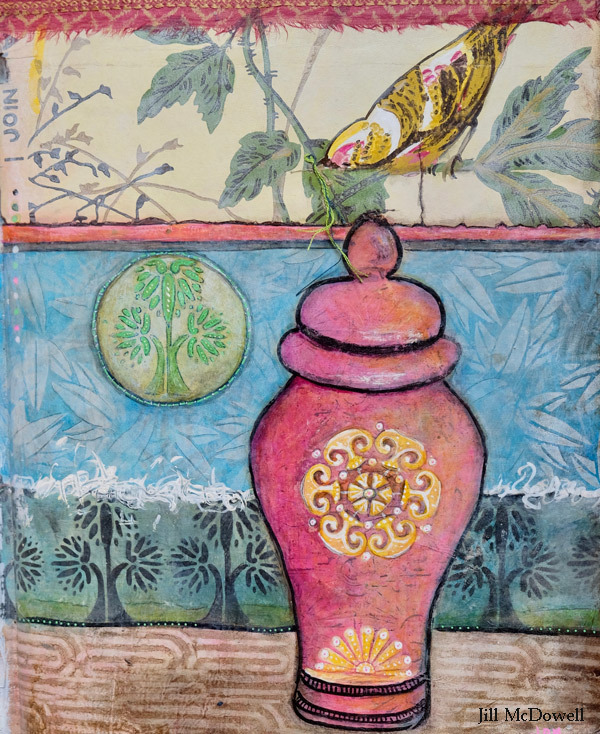 Ginger Jar Stencil with Masks, 6"x6"
This is a page in Jill's altered book. 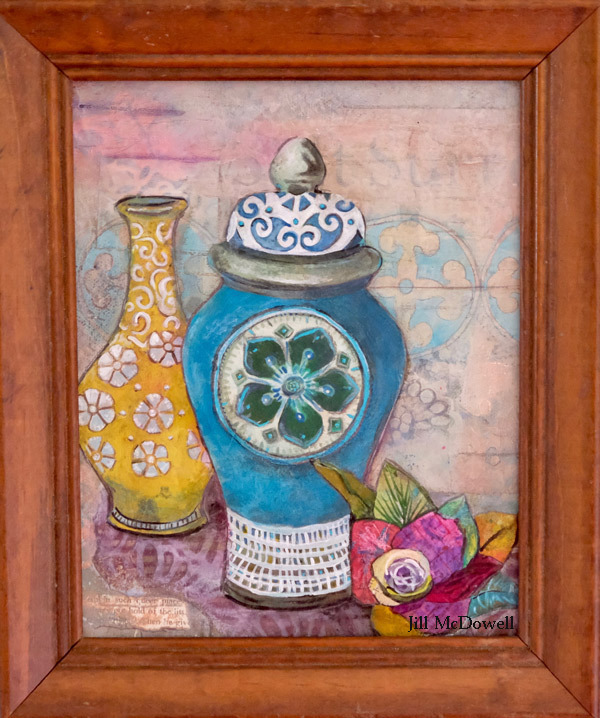 It is constructed from vintage papers, deli paper, acrylic paints, and china markers. 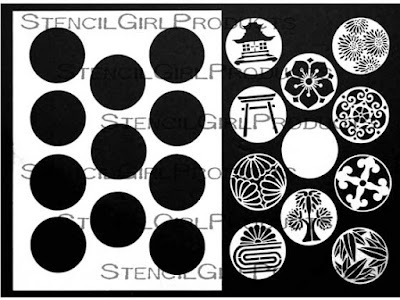 The flowers are made from elements from the Crest inspired by a china plate, the leaves from the wild ginger crest, and the grass from the wild cherry blossom crest. See one of the crests tucked away as a page tab? The quote is from A.A.Milne. Crests Stencil with Masks, 9"x12"
"Can you tell that I have a thing for blue and white?" Jill asks. 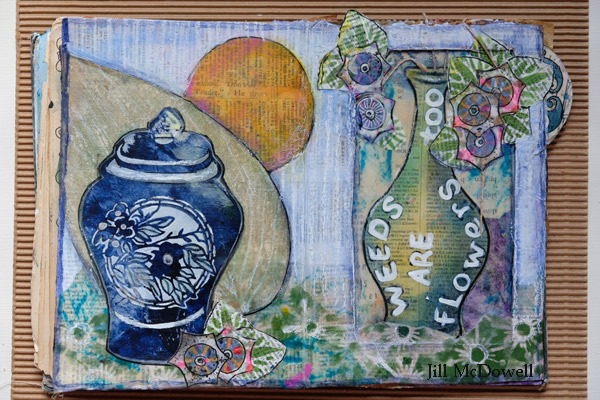 All of these crests are Gelli Prints on deli paper, tissue paper, and book text. Their 2 1/2” size is perfect for ATC’s and ideal for working on the Gelli Plate, especially the small round Gelli plate so you can use them as a stamp in your art journal. Jill glued them onto two glued together sheets of card stock, let them dry overnight in between layers of the paper of a heavy book and deli paper, then used a 2 1/2” punch to cut them out. Chinoiserie Bouquet Stencil with Mask, 6"x6"
Pictured below is mixed media fabric collage Jill built on a burlap page in her art journal. 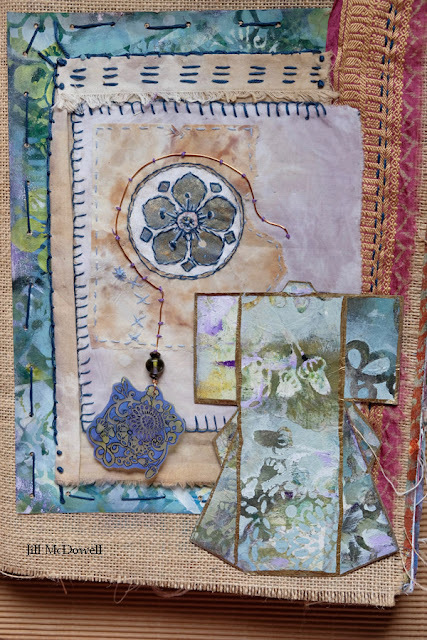 She says, "It all started with some tea staining of some cotton fabrics and rice papers; so much fun. I stitched a few pieces together with embroidery thread and added a Wild Cherry Crest that I had stenciled onto rice paper. 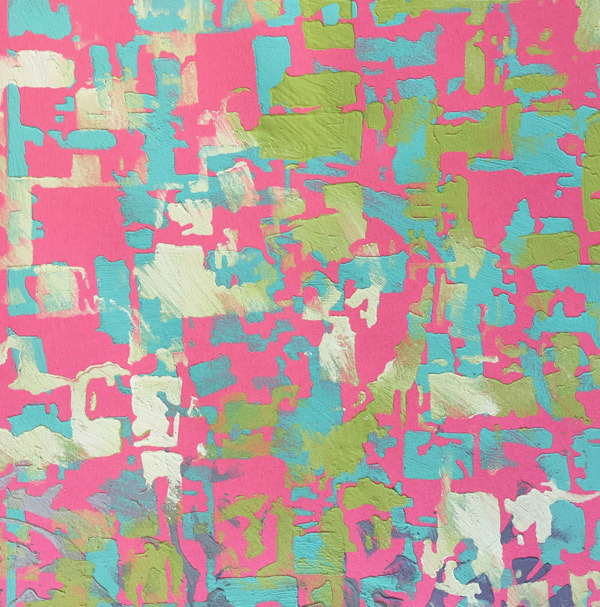 More embroidery ensued, French knots, and sari scraps were added… Then I made a Gelli Print on deli paper that was just a little too dark for my taste. To tone it down I sponged gesso over the Chinoiserie Bouquet Mask (CBM) in a very messy manner. I loved, loved, loved the result. Decided to use it to piece together a Kimono on card stock. Used the Wild Cherry Crest to create the background on copy paper using acrylic paint. I punched holes in the paper with a Cropodile to keep it from tearing, sewed it onto the burlap, and added the tea stained collage on top. I finished it off with the CBM Copper Wire Dangle attached with embroidery floss. I quite love how it reminds me of a silhouette." About the Dangle: "I love, love, love how this came out too! I used cosmetic sponges to apply ink from Moonlight Duo Hybrid Ink Pads over the Chinoiserie Bouquet Mask (CBM), I waited a few minutes for it to dry then flipped it over and sponged another color onto the back. Once that dried I outlined the front of the design with India ink using a dip pen. I used a Cropodile to make a hanging hole, cut it out with a sharp X-Acto Blade, and shrank it with my heat gun, flattening it with an acrylic block at the end. I finished it off with copper wire and beads." 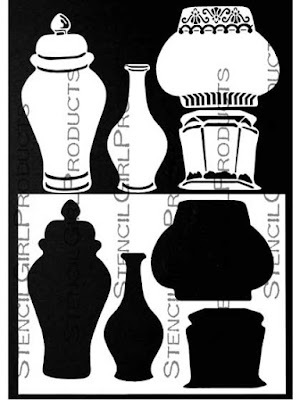 Jardiniere Stencil with Masks, 12"x12"
All of Daniella's stencils in this release are 6"x6". Citrus slices, wagon wheels, hubcaps? 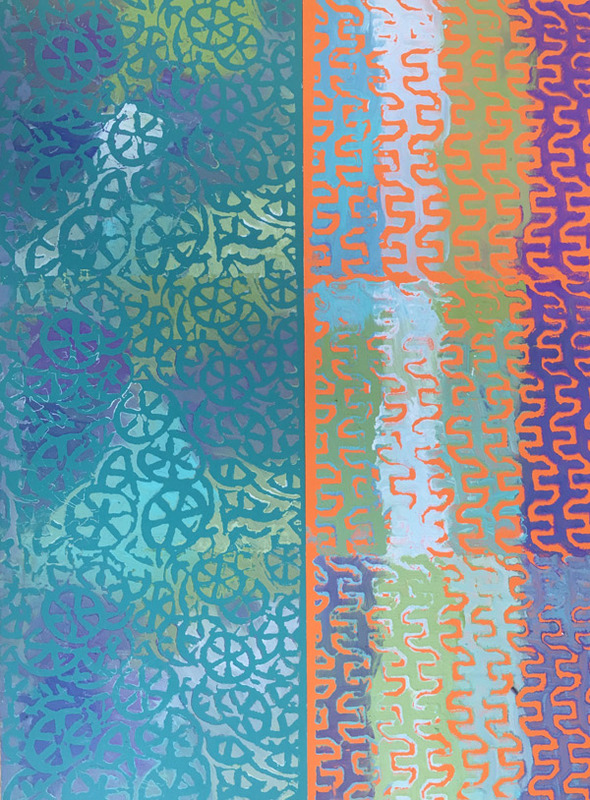 What the abstracted circular divided patterns might be on Daniella Woolf's Wheels Stencil is in the eye of the beholder and she likes it that way because it gives the user artistic freedom. 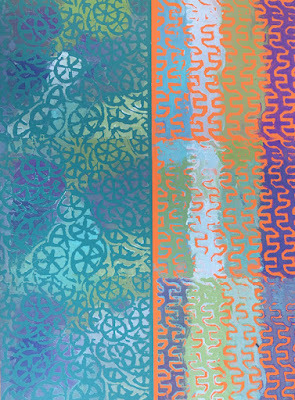 Daniella Woolf's Switchbacks Stencil reminds us that the long road may twist and turn on itself as it occasionally connects to other winding paths. 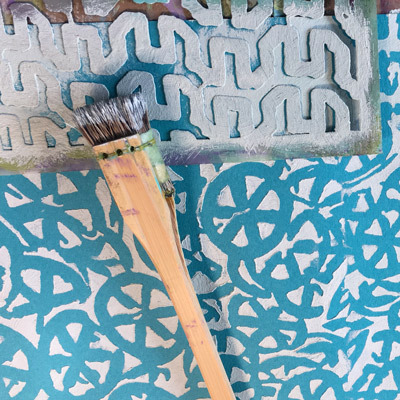 The little details on the many trails within this stencil make it a natural for backgrounds in your artwork. Bring it into the foreground and write along the open spaces. This pattern works really well as a long repeat! 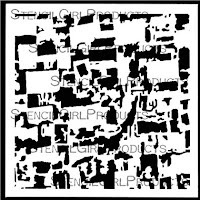 Scattered pictures form the foundation of Daniella Woolf's Photos Stencil. 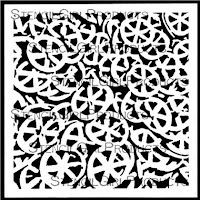 Whether the abstract images you stencil are vintage or modern in tone, this is a fine design for scrapbook layouts, art journaling, and mixed media painting. These leave some nice open spaces in which you could insert text or…? 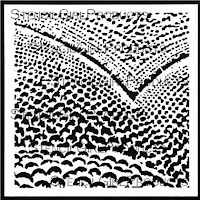 Fruit trees on a hillside viewed from above inspired Daniella Woolf's Orchard Stencil. 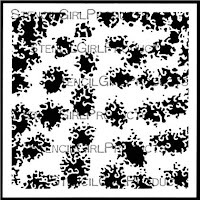 This stencil can be used easily in its entirety and it has wonderful sections if you only wanted to paint parts of it. That "V" in the stencil could be used to focus the eye. This one works really well with the wheels stencil. It gives the illusion that there is an abundant harvest, beneath the orchard. A giant pond plant with enormous leaves was the inspiration for Daniella Woolf's Pollen for the Bees Stencil that looks a bit like pollen. "In December, Ursula Oberg of Greenspace, a collector of my work, invited me to experiment with combining Greenspace’s paints and my stencils. A tenet of my work philosophy is to limit my work options to only a few elements, so I was game for this design challenge. We met here at the store, and I left with paint and paint swatches. "Technically, the clay paint and marble and chalk-based mineral paint were different from others with which I have worked. They had an earthy weightiness. They mixed easily and dried quickly. The clean up was easy. These paints pushed through the stencils efficiently, not bleeding or spreading much. 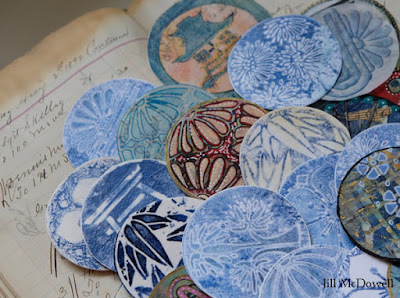 They are very opaque and easy to layer, became quite dimensional, and were fun to scratch through. They had good adhesion. The milk paint (realmilkpaint.com) had to be mixed with water and I used a mortar and pestle to grind it a bit. It is very pigment rich and could be thinned to be quite translucent, so a very good opposite to the opacity of the Bioshield (bioshieldpaint.com)and Koloranti Paints (koloranti.com). 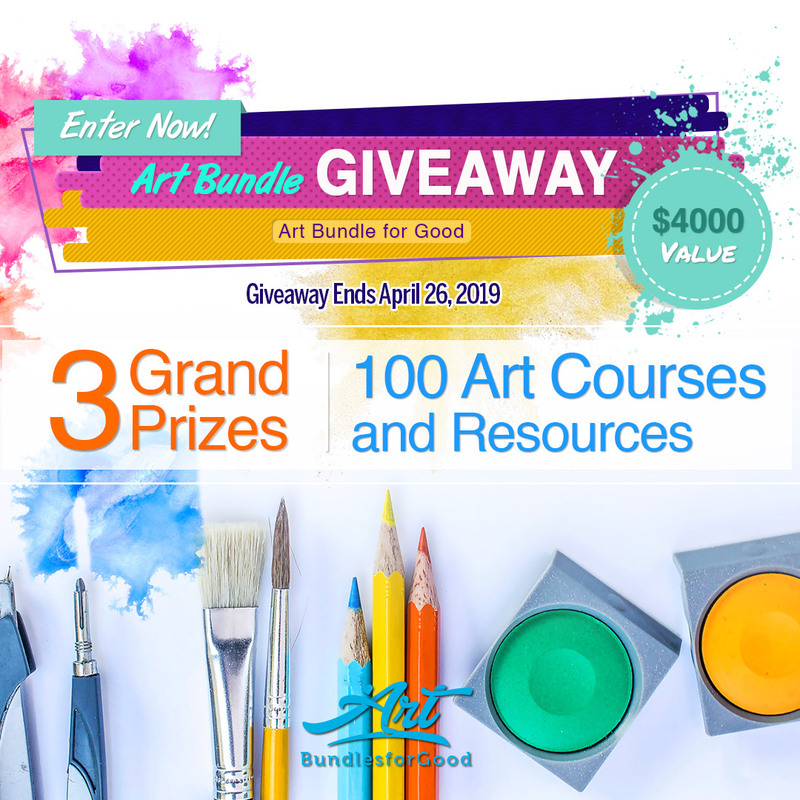 "Being an encaustic practitioner for the past nearly 20 years lead me to think this would be a lovely ground on which to paint encaustic medium. I recently bought a Japanese stencil brush at Codex, a book fair. 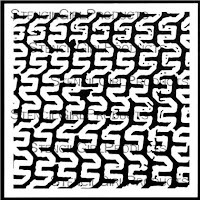 It is made with deer hair, and works beautifully with my stencils!" 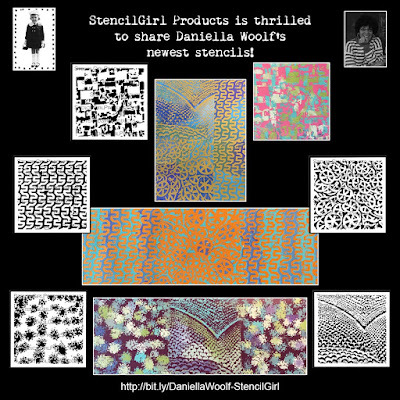 You'll find all the latest stencils and masks here, and stencils specifically designed by Daniella Woolf here, or by Jill McDowell here.